With its patented EzLoad technology, the Brand New GBC Ultima 35 EzLoad Laminator is the next generation of roll laminating machines. The innovative design greatly reduces film-loading time and prevents the user from loading the film upside down, thus eliminating costly service calls. Packed with features including a mil thickness range of 1.7 mil to 5 mil NAP II Lo-melt laminating films, one minute warm up and more, the GBC Ultima 35 EzLoad roll laminator provides a quality laminating experience. The GBC Ultima 35 EZLoad laminator is ideally suited for new users, multiple users, and schools. Motor Reverse-Function. Reversible motor assists in removal of film wraps. Everything works as expected. Great For laminating 11 x 17 papers. I looked for the seamless lamination machine for me to be able to use for school projects and I have now owned this laminator for one year and love it. I have gone through two sets of rolls, thats how much I use it and it has never let me down. I highly recommend it! Really easy to use and really easy to load the rolls. love the machine,works perfectly, i hate to load the rolls, i find it hard. a video of how to would be great. the instrution booklet is not well explained. We were looking for a roll laminator for our office but we mostly just do normal sized paper. This machine was perfect. There are a bunch of different thicknesses of laminate available for it and it fits nicely in our copier room. Welcome to MyBinding video. Today we look at the HeatSeal Ultima 35 EzLoad, a 12-inch roll laminator by GBC. 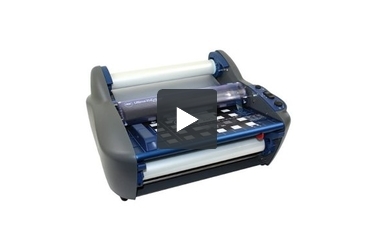 Easy and super fast, the Ultima 35 is a great roll laminator. The side fence helps keep your projects consistent as you send them through. Simple forward and reverse knob keeps things quick and to the point, and spin the dial to set the heat level. This is on ten mil thickness, so it's as slow as it possibly can go and you can see it's pretty fast. Your project comes out the backside. When it's all set, turn the machine off and cut it. You can do so with scissors or with the razor tool on the backside of the machine, which is very convenient for tight spaces. Switching out the laminate rolls is quite easy. Simply lift up the lever on each side of the roll and pull it off. You can thread it right out by pushing the forward or reverse button. You get to the bottom roll by unlocking the table, pushing the two levers again, and remove it and replace it the same way. There it is, the HeatSeal Ultima 35 EzLoad by GBC. For more demos, reviews, and how tos on this product and many more, check out MyBinding.com. 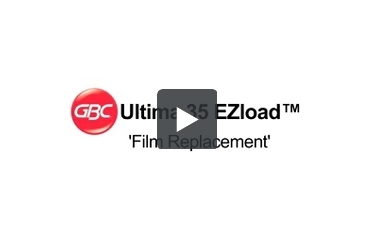 The Ultima 35 EZLoad uses EZLoad technology to ensure fast, easy, and error-free film loading. Color coded end caps on each roll of film allow you to quickly and correctly drop the rolls into the laminator therefore eliminating the chance of loading the film backwards. Once the new rolls of film are locked into place, you’ll then need to thread the new film through the laminator. There are two ways to thread the film using either existing film left of the heat shoe after cutting the film from the rolls or using a threading cutter. When loading film into the laminator where there is no existing film over the heat shoe, you will need to use the threading card method. First let’s explore the method of using existing film for threading. This method works best when the laminator is warmed up. Preheat the laminator until the ready light illuminates. Remove the feed table by first disengaging the locks at both ends. The laminator will automatically power off once the feed table is removed. Without removing the heat shield, cut the remaining top and bottom films between the rolls and the heat shoe. You now have film remaining intact on the heat shoe detached from both the top and bottom rolls. Remove the heat shield. Remove the bottom film roll by unlocking the latches on both ends of the laminator and lifting the roll out of the cradle. Now remove the top roll of film in the same way. Place the new roll of film into the cradles by matching the color and size of each end cap to the color and size of the cradles. Then close the latches. Unroll enough film from the top roll to tuck under the idler bar and drape over the heat shoe. Unroll enough film from the bottom roll to tack on to the existing film on the heat shoe leaving a little slack. Replace the feed table and reengage the locks. Replace the heat shield. Turn the laminator on and allow the machine to warm up. When the ready light illuminates, set the dial to 1 and press the up arrow. To ensure proper feeding, both the old and the new films must advance at the same time. Any separation between the films will require repositioning of the film over the heat shoe. After the newly threaded film has completely exited from the rear and the output is clear, press stop. Trim off the excess film from the rear with the built-in trimmer. Now you’re ready to laminate. Let’s now explore the other method of film threading by using a threading card. This method also works best when the laminator is preheated. Look for the threading card enclosed inside of the packaging. You can also use a manila folder or any letter sized cardstock to substitute the threading card. Remove the heat shield and feed table. Replace the top and bottom films we’re told the same steps as described earlier. Unroll enough film from the top roll to tuck under the idler bar and drape over the heat shoe. Now lift the bottom film up and drape over the top film on the heat shoe. At this point, the bottom and the top film will begin to adhere forming one film. Install the feed table and the heat shield. Turn the machine back on and again allow it to warm up. Set the dial to 1 and press up. Slide the threading card into the laminator and allow it to feed completely through. Once the card exits from the rear and the output is clear, push stop. Trim off the excess film from the rear with the built-in trimmer. Your film is now installed. The GBC Ultima 35 was introduced to the laminating machine market as an answer to a couple of needs. First, it was designed to be a low-cost roll laminator that just about any business, church or school could afford. Second, they wanted to address the ongoing problem of users feeding roll laminators incorrectly and damaging their machines. Here we take a look at the Ultima 35 and list what we consider to be its strengths and weaknesses. One of the first things we noticed (and liked) about the Ultima 35 is the extremely fast warm-up time of one to two minutes. This compares extremely favorably to almost any other machine on the market, and should be a big boost to productivity. The big shining feature of the Ultima 35 is that it finally addresses the problem of inexperienced or distracted users loading the laminating film backwards on roll laminators. In other words, users who, quite by accident, load their laminators with the adhesive side facing toward the rollers. We don't know of you have ever done this on a roll laminator, but rest assured all it does is create a huge mess, and usually a service call is required at that point. The Ultima 35 has solved this problem by use of a specialized type of laminating film that has a different sized core on each side of the film. This makes it absolutely impossible to load the film the wrong way. The Ultima 35 is pretty versatile, accepting roll film from 1.7 to 10mil thick. This means that you will be able to laminate just about any sort of document in all of the available rigidities. In theory, that is. For the first year that this machine was on the market 10mil film was not available. However, GBC recently released both 7mil and 10mil film for use with the Ultima35. Also, in 2008, GBC made available some matte films for the Ultima 35 in addition to their standard gloss films. Some of the other things that we really liked about the Ultima 35 were that you can adjust the speed at which it laminates, which is great for laminating different paper styles and materials. Also, this machine has both forward and reverse functions helping with any wraps or jams that may occur. And finally, we really appreciated the inclusion of a handy built in trimmer to help with the finishing process. We suppose one could consider it weakness that all of the supplies intended to be used with the Ultima 35 (such as laminating rolls) are proprietary. This means is that the user will be required to buy and use the rolls that are specifically designed by GBC to work with this machine. Unfortunately, these supplies are a little bit more expensive than other similar supplies that are available. However, this machine is so much lower in price (not to mention feature-rich) than most other similarly equipped laminators on the market, it may be well worth it in the end. Though, as we mentioned above, you can't load the Ultima 35 the wrong way, loading it the right way is not the easiest thing in the world, and may take you a time or two to master. Once you've got the hang of it, however you should be breezing along. how thick can the item being laminated be? Thank you for your question. The GBC HeatSeal Ultima 35 EzLoad 12" Roll Laminator is designed to work with paper and card stock. It would now work with boards and thicker items. Thank you for your question. We do ship internationally. If you put items in your cart and view the cart, you can enter your country and postal code to get the shipping cost. For international orders we only accept PayPal or wire transfer (there is a fee for wire transfers) as payment. For orders paid with PayPal, the order must ship to the shipping address associated with the PayPal account. All prices on the website are in US Dollars, for most accurate and up to date exchange rates please contact your financial institution. Please contact our customer service department directly if you need assistance placing the order and we would be happy to help. I bought this machine and I really like it but it waste alot of laminating before the item gets to it. Is there anyway not to waste so much? Thank you for your question. Unfortunately with a roll laminator there tends to be a fair amount of waste if you are just laminating one piece at a time due to the "leading edge" coming off the roll. The most efficient way to laminate is in batches that way you can control the spacing between sheets and you only have that one "leading edge".